Spring weather means that homeowners start more indoor renovation projects, as well as outside work with pressure washers and other power tools to spruce up their homes. It’s important that your home’s electrical system, along with the receptacles and wiring in the appliances or tools themselves, are properly grounded. To explain it simply, “grounding” means that a low-resistance path has been created for electricity to travel into the ground. In an electric circuit, the current that travels to an appliance is carried back through the system via a neutral wire. If there is a power surge or short circuit while you are using a appliance, having a grounding system to divert the current into the Earth will prevent you from electrical shock. Ground-fault circuit interrupters (GFCI) are one form of grounding. GFCI outlets act as split-second circuit breakers to shut off power and redirect electrical current. Most homes also have a form of grounding at the main electrical panel. One way to make sure you have ground-fault and other grounding protecting is to look at your outlets and electrical plugs on your appliances. 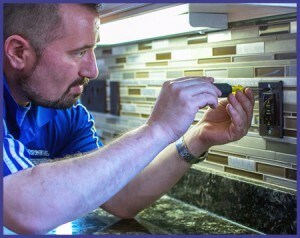 GFCI outlets — which are required in kitchens and other areas of your home that could get wet — have two small buttons in the middle marked “test” and “reset”. Outlets with three receptacles, and plugs that have three prongs, contain a ground wire. If you are unsure whether any of your home’s electrical receptacles, or the system as a whole, are lacking in ground-fault outlets or other grounding, contact us to come and take a look at your electrical system.